A theatre console requires great flexibility to make programming complex cues as quick and easy as possible. Implementing any lighting change the director throws at you quickly and painlessly is second only to reliability. 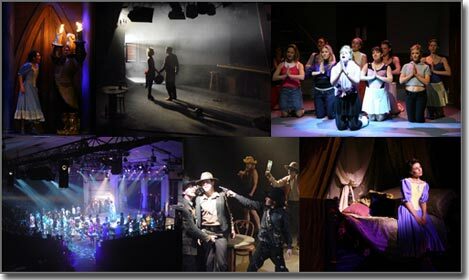 With LightFactory you get a cue engine built by lighting designers with theatre specifically in mind. We call LightFactory a no-compromise PC solution, providing speed, flexibility and reliability in the most cost effective package available. Full tracking system that can be turned off per fixture or per cue. Simple split and cross fading. Cue effects can each have a separate delayed start, fade in and fade out. The same effect can be re-used in different cues with different timing. "Using LightFactory as our lighting control for Beauty and the Beast in Auckland was definitely a good choice. A quick introduction to the software and we were away. We found that it was very intuitive to learn, simple to operate and also had very powerful features. We imported the dimmer patch from an Excel spreadsheet which saved a lot of copy typing as it included the channel descriptions also. This was initially done on the demo version you download off the web. The different effects available such as chases, time line, moving light effects etc., were all used and extremely easy to learn and build. Any number of these could then be added into your cues with ease. This is not a dedicated moving lights console and as such was very easy to control conventional luminaires with. I would recommend to anyone looking at upgrading their desk to look at this option."